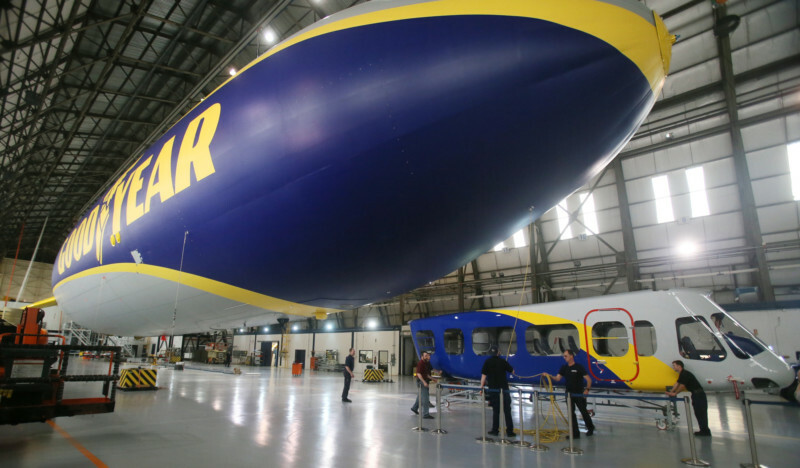 Goodyear’s newest airship likely will be flying in Akron-area skies toward the end of June. 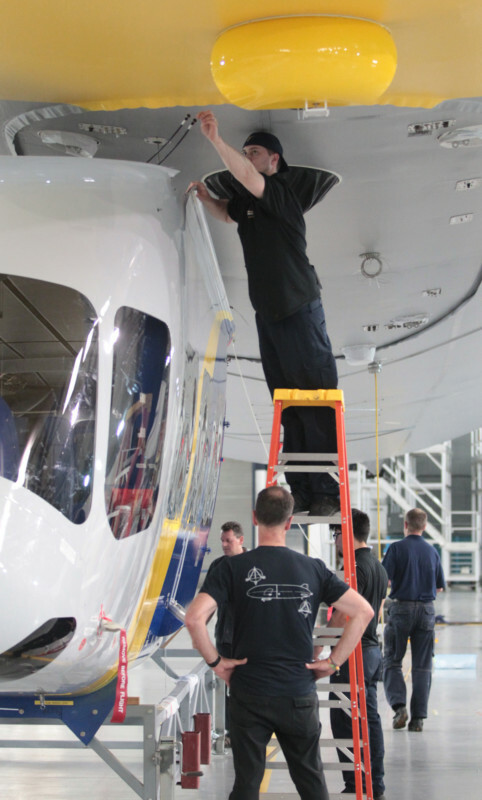 The Akron tire maker’s third and final NT, or New Technology, semi-rigid airship is in the end stages of being built inside the company’s Wingfoot Lake blimp hangar in Suffield Township a year after assembly first began. 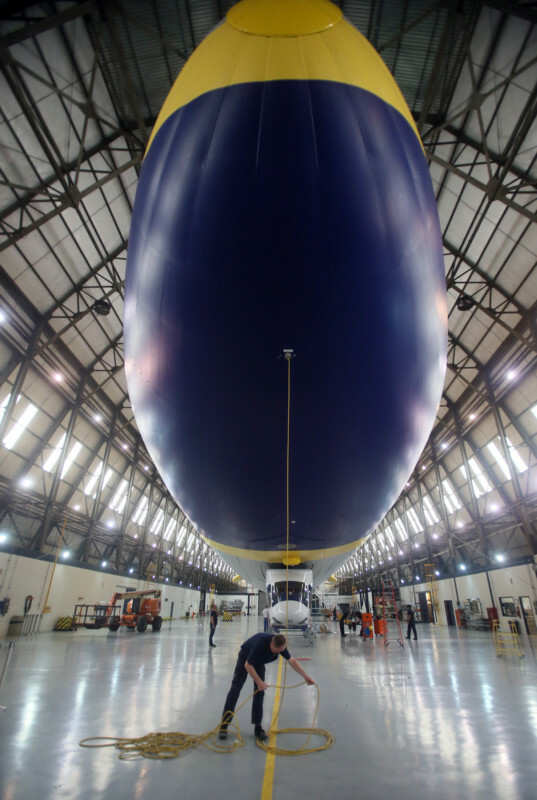 The gondola rests on a platform as Zeppelin workers get ready to move it in place to attach it to Goodyear’s latest airship at the Goodyear Wingfoot Lake blimp hangar on Friday, May 18, 2018 in Suffield Township, Ohio. One major step took place early Friday afternoon when crew members rolled the newly arrived gondola, the part that holds the crew and passengers, into position underneath the cavernous gas-holding envelope. In upcoming days, the structure will be permanently attached to the envelope by workers with Zeppelin, the German manufacturer that makes the airship. The gondola rests on a platform as Zeppelin workers get ready to move it in place to attach it to Goodyear’s latest airship. In this case, Ogden said, the gondola has two windows in the rear — which also can be opened — compared to the previous two NT airships which do not have windows in that space. 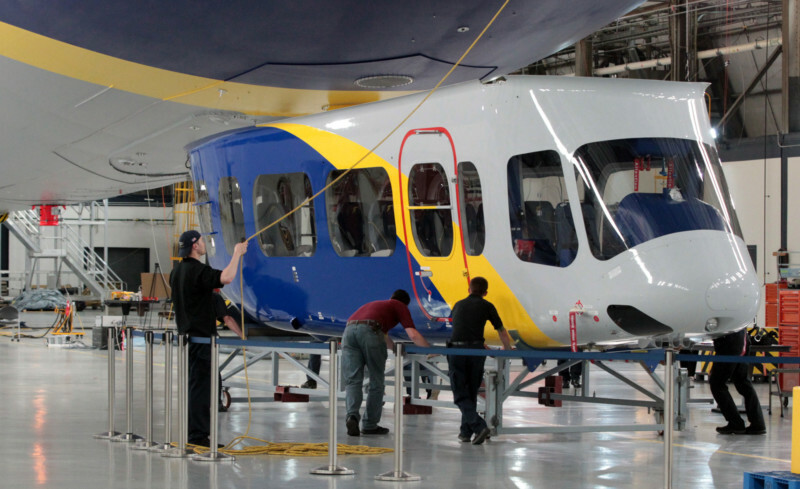 Zeppelin workers move the new gondola in place to attach it to Goodyear’s latest airship. The airship is suspended from the hangar ceiling — the envelope is currently filled with air, allowing crew members to work inside as needed. The nonflammable lighter-than- air helium that gives the airship its lift will be pumped in after much of the other work comes to an end. That includes attaching and testing three engines and rotors to the airship’s strong but lightweight internal frame. The engines, which can swivel up and down to allow the airship to take off and land like a helicopter, are scheduled to be delivered to the hangar later this month. A Zeppelin worker moves wires so the new gondola can be moved into place to attach it to Goodyear’s latest airship. Based on the work that remains, the new airship likely will take its first test flight at the end of June, Ogden said. The new gondola rest in place ready to be attached to Goodyear’s latest airship after Zeppelin workers moved it at the Goodyear Wingfoot Lake blimp hangar. 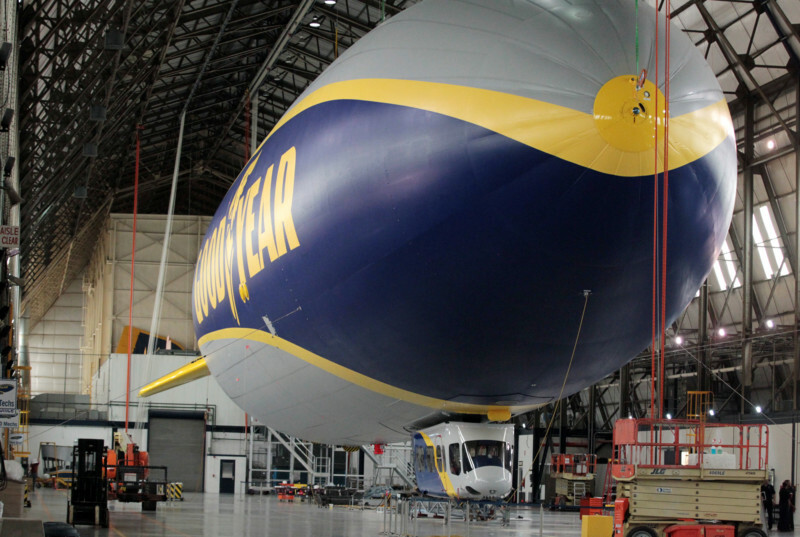 Wingfoot One is scheduled to fly up from its Florida base in early June and stay in the area for a while, Ogden said. That airship first flew in March 2014; Wingfoot Two first flew in 2016 and was stationed at the Wingfoot Lake base until last fall when it flew to its permanent home in California. 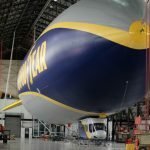 It’s possible — but not definite — that when the NT3 is completed it may fly in tandem with Wingfoot One before that airship heads back south to Florida. 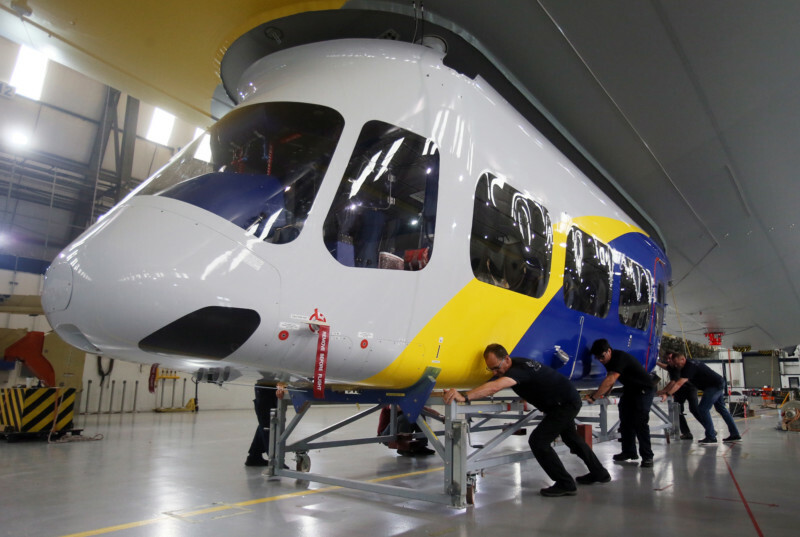 Markus Draeger of Zeppelin coils up a guide line after workers positioned the new gondola in place to attach it to Goodyear’s latest airship. 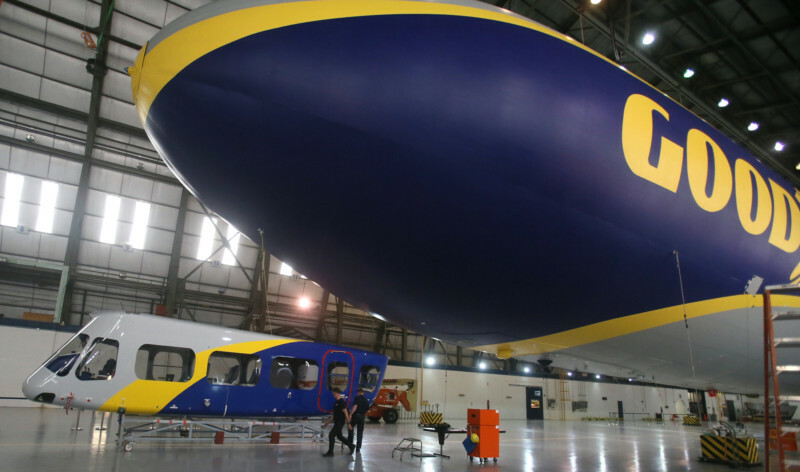 With all of the new airship technology, a significant piece of Goodyear blimp history has been placed carefully in a corner of the hangar — the gondola of Goodyear’s last true blimp, a GZ-20 model called the Spirit of Innovation, that was retired in March 2017. The Beacon Journal did a series, Blimp Garage, that followed the construction of the blimp starting in 2005 to its first flight in 2006. Goodyear built 15 GZ-20 blimps from 1969 to 2006. The Spirit of Innovation gondola will remain on display in the Wingfoot Lake hangar as an historic artifact for public tours of the facility. This entry was posted in Airships, Blimps, Semi-Rigid and tagged airship, blimp, Blimp NT, goodyear, Goodyear blimp, Wingfoot Lake, Wingfoot One, Wingfoot Two. Bookmark the permalink.